Please refer to our stock # 10450 when inquiring. 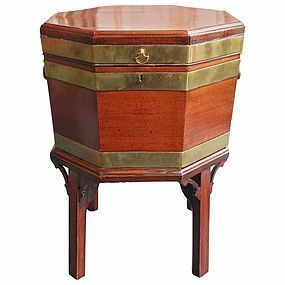 Fine George III Octagonal Cellarette or Wine Cooler in mahogany with brass banding, having a hinged lid opening to a tin liner, slightly tapered body with brass carrying handles and the original stand with four champfered legs. English, circa 1780. Originally used in the dining room to hold wine brought up from the cellar for the meal, the tin liner would have protected the wood from the condensation from the bottles. Now often used as an occasional or end table.